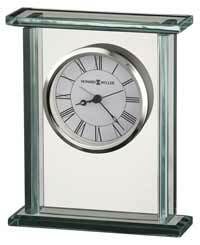 The Howard Miller 635-191 Megan Mantle Clock has a High Polish Walnut finish with two brushed aluminum panels that accent the top and bottom of the dial. 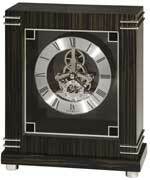 The frosted glass face has black Roman numerals and straight black hour, minute, and seconds hands. It sit in front of a satin silver back ground. 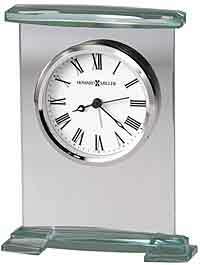 Non-Chiming, time only movement. Felt covers the bottom of the silver feet to protect you furniture. Accurate Quartz non-chiming movement requires one (AA) battery. 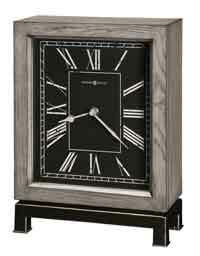 Clocks for sale at The Clock Depot including the 635-191 at discount prices.